While we may give Porsche some flack for building an SUV, the Cayenne is rather good at everything it's supposed to be good at. It can haul things, it can go off road, it's kind of fun to drive, and it doesn't randomly burst into flames. Well, it looks like we may have to strike that last one off the list. He left it idling in the driveway for 2 minutes while he ran inside to get something. When he came back out and got in, there was smoke coming from the dash. Upon closer inspection, the underside of the dash was literally melting and dripping onto the carpeted floor by the pedals. He tried to put out the fire inside the dash somewhere without being able to see it to no avail, eventually giving up when he saw flames coming up along the front windshield and calling 911. 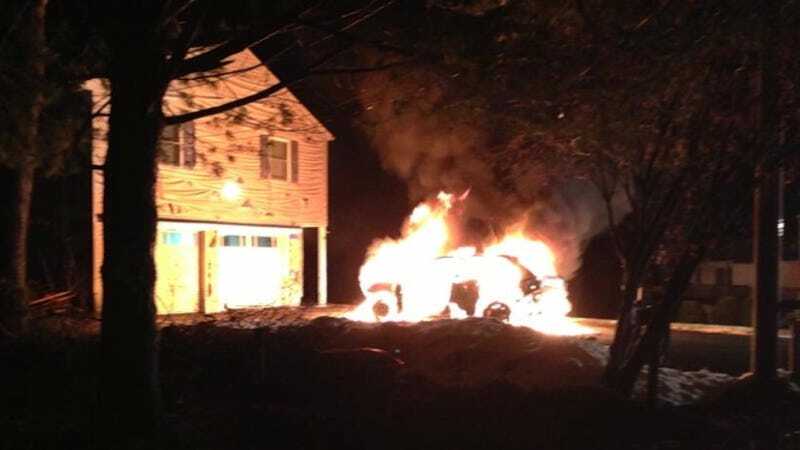 By the time the fire department arrived the car looked like the attached picture. We have never heard of something like this happening to a Porsche Cayenne before. Normally, cars like Ferrari 458s or Fisker Karmas are the culprits in an expensive self immolation. Ashly also told us that her father normally parks the car in the garage, so a lot of possible damage was avoided in the fire. But the house wasn't totally saved in the fire. The front siding of the house is clearly damaged and melted. Not good. We've reached out to Porsche to see if they've seen any other issues like this occur with the Cayenne.